1. It is up to the brewer to decide how their beer is made and dispensed. 2. Beer should be taken seriously but is essentially a drink to be enjoyed and celebrated with good humour. 3. It is not for a select few to tell everyone what is or is not a good beer. The best way of judging if a beer is good is to listen to the people drinking it. 4. The CAMRGB is neither provincial nor nationalistic. We enjoy beer from all over the world. 5. Any discussions on points relating to beer or to The CAMRGB will be met with good humour and open, friendly communication. 6. The CAMRGB is not about leaders and followers it is about people making new friends and connections. To this end The CAMRGB is open to anyone unless they bring prejudice of any kind to the group. 7. One should never forget the power of communication, even if it’s a bit tipsy. 8. Celebrate beer because beer is brilliant. 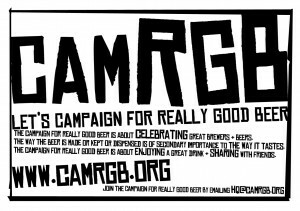 Over the last week or so I’ve had several people send me links to blogs that have been talking about The Campaign For Really Good Beer. Just over half of them have been knocking CAMRGB in one way or another. Or they’ve at least been doing a Derrida and disassembling it to find out what it means. Initially I told myself I wouldn’t get involved in the debate. I’d just let people say what they want to and carry on regardless. But last night I thought about all the things people have been saying and it suddenly struck me how obvious it was what CAMRGB is really all about, and how I can sum it up in one simple (though probably convoluted as I like a bit of a rant) metaphor. Many bloggers have said they can’t see exactly what CAMRGB is all about, that it’s a bit glib, faux naive, and that a movement needs to take sides. If honesty and straightforward talking comes across as naive (however faux it might be) then so be it. Yes, I may come across as a bit glib, we all have our faults. As for which side are we one, well, I think it’s absolutely obvious which side we’re on. I approach the way I buy beer in exactly the same way that I used to buy records. I’m constantly looking for something new to try, to discover, to excite me. It appears, from what’s been happening over the last few weeks since CAMRGB began is that there are two distinct camps of people – They all love great beer, but they have distinctly different ways of expressing it. And those ways again are part of my extended music metaphor. My father was a classically trained musician and he had to take everything apart to explain why something was good. If he heard me playing a new 7″ over and over and over he’d ask why I liked it so much. And therein lies the crux of CAMRGB. There are people who want, like Prog Rock fans of yore (and don’t get me wrong I love Hatfield and The North and Genesis and Henry Cow), to “understand” why something is good. They seem to need to quantify everything by taking it apart and then being able to lecture on how they know that this thing is good because they have spent a long time studying it and its constituent parts are x, y and z. Then there are people who, like the record buyers I was part of in the late 70’s and through the 80’s, would put all their energy into discovering, and when they found something that made their heart race and their hair stand on end and made them smile for a week and want to listen over and over and over out of pure joy felt the overwhelming need to SHARE. To tell someone, anyone, everyone else about what they’d just discovered. As we get older those moments of pure unadulterated joy get less and less. Musically we turn into our parents and start talking about how music used to be. Yes we buy and enjoy new things, but that immense feeling of sheer jubilation isn’t there. The one and only place I come close to that feeling is when I go into an independent beer shop or into a good pub and look at the beers from all over the world, from tiny little breweries, from people who work with passion. 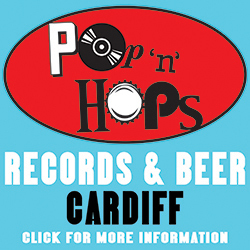 I do the same as I used to do in record shops – I talk to the owner, I pick up and put down bottles, studying the labels for hints of why this one should be the one I try today. And then if the one I choose is amazing I want everyone to know about it so they can try it too. They may not enjoy it as much as I did, but at least I’ll have shared my passion. That ladies and gentlemen, is what The Campaign For Really Good Beer is all about, and if you think me naive and if you think me glib I couldn’t care less. This is our open letter to CAMRA that really began the whole CAMRGB thing. 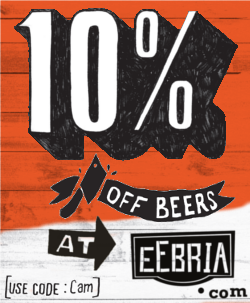 We love beer as much as you do. We don’t want a war – of words or otherwise. We want more people to think about the beer they drink and become more adventurous in this world of watery bland lager. We have enormous respect for much of the work that CAMRA does and many of the battles CAMRA has fought. However, we believe that many of those battles were won some time ago and that imposing such stringent rules on what is a Real British Ale alienates not only many of the small artisan brewers in the UK but also many of the people who enjoy the beer made by them. This country of ours makes an extraordinary range of craft beers and we should celebrate them by supporting them. That means buying their beers and telling everyone else about them too. We are uncomfortable with the stranglehold that CAMRA and its rules has over British brewing. The imposing of rules about kegs and casks, yeast quotients etc. are holding back the world of modern brewing in the UK and is definitely alienating many many people in the UK who would otherwise start drinking the products of our small brewers and enjoying them. There’s a whole generation of younger people who look at the archetypal CAMRA member as a beard wearing, sandal sporting beer geek. Drinking and enjoying beer, sitting in pubs and talking / discussing / arguing. Getting slightly tipsy and giggling. These are all wonderful and fun and important things to do. Let’s not hold people back anymore by imposing draconian measures on what is and is not the “real” pursuit of good beer. Let’s enjoy good beer for good beer’s sake. Let’s thank all our amazing brewers for the astonishing range of drinks they provide. Let’s sit down and discuss the parameters of getting people involved.